Therefore, my dear brothers and sisters, stand firm. Let nothing move you. Always give yourself fully to the work of the Lord, because you know that your labor in the Lord is not in vain. As I was leaving Guatemala, I really struggled with being able to see the purpose of life in America. I loved the experiences, lifestyle, and opportunities that were available to us during the Internship and I didn’t want to move on from it. As I was wrestling with the thought of leaving, I opened my notebook to the verse above. It reminded me of a truth that the Para Servir Internship taught us. That our lives as Christians are to be servants. A saying that filled our household was “its not about me”, and that didn’t resonate fully with me until it was time to leave. Our lives are not our own, they belong to the Lord, and when we give ourselves fully to him, He can use them for unimaginable wonders. During the internship, I saw each of the girls commit themselves to the Lord in new ways. The internship allowed us to grow spiritually, build strong relationships, and be able to help the physical needs of a family along the way. In my individual spiritual life, I have grown much deeper in my desire and knowledge of the Lord. My eyes have been opened to see how much glory I steal from him, how easily I belittle him, and how intentional he is. Through Bible studies, conversations, and our daily life there, we saw God at work in and around us. One thing I loved, was that our discussions and times of growth were not limited to certain times of the week. At breakfast, lunch, dinner, on the work sight or on a weekend excursion, Christ was the center of our conversations. 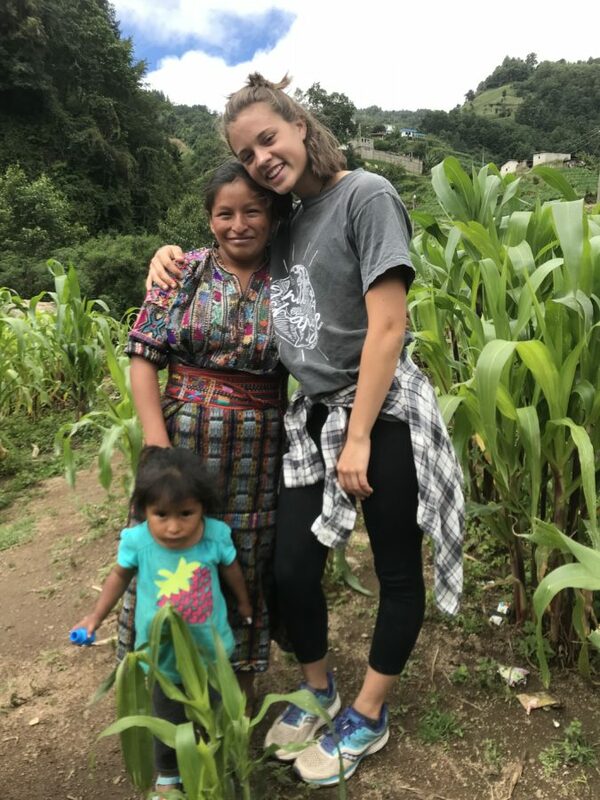 The more obvious part of our time in Guatemala was spent doing the hard labor to give Lilian and her kids a new house. I honestly didn’t even realize the magnitude of this need until I walked into the house myself. To sit and talk to Lilian for a few moments was difficult and painful because the smoke from her cooking filled the whole house and burned your eyes. It affected the kids health and safety more than I could have imagined and I’m so thankful to have been a part in changing that situation. It was a blessing to be able to see the progress of our labor and understand the affect it would have on our family. On the last day, I remember walking through the house with some of the girls acting out what life my look like for the family when they move in. What I love about Dirty Feet Missions is that though the house construction was our mission “on paper”, it was not our real priority. Our priority was to love the family and show them who Jesus was through our relationships. We saw the impact of building relationships. We were able to build relationships within the group of interns, with the family, with the foreman, and more. The last workday showed me how much we really impacted the family and our foreman. Before we left, Hector asked “van a venir manana?”//” Are you going to come tomorrow?” Even now hearing that hurts my heart, but I think its a beautiful representation of what we did while there. Being there for 6 weeks gave them a constant stream of activity and excitement/ joy and hope. It wasn’t a short gathering of acquaintance, it was the building of a family. Lilian shared that we were a part of her family that would always be in her heart even when we are gone. Even one of our foreman cried with us as we said goodbye. While it was a sad day to say goodbye, I think the tears are proof of the relationships we built. On both sides, our hearts broke to leave behind friendships that meant so much and impacted our lives so deeply. While it hurts my heart to have to say goodbye, I am so thankful for a new family that would make it so hard to leave. Thank you Dirty Feet for this opportunity.